The original was launched back in 1998 and, in truth, was never really much kop. That all changed, though, when the MK2 Skoda Octavia was birthed. Skoda’s flagship saloon car had become a serious contender for your money, thanks to an intoxicating blend of alternative style, build quality and economical engines. The vRS model was introduced to appeal to the drivers who prefer horsepower over economy, and with a 0-62mph time of just 7.2 seconds, it certainly worked. There’s been a couple minor facelifts since the original, so rest assured the latest cars come with all of today’s tech and economical engines. Ever since Skoda was taken over by VW back in 1991, the marque has undergone quite a transformation. Skoda is now classed under the premium sector of the market and VW has seriously done a brilliant job with Skoda and all the cars come with everything you’d expect of a modern-day saloon. Auto climate control, ESP, airbags everywhere and the most up-to-date VAG engines mean the Octavia drives just a well as it looks. If you want something alternative and well made, the Octavia is a superb choice. All second-hand Octavia’s drive like a saloon; by which we mean they’re a little soft and do suffer from roll in the bends, but they’re anything but disappointing. The boot is rather enormous, while the interior quality is second to none. 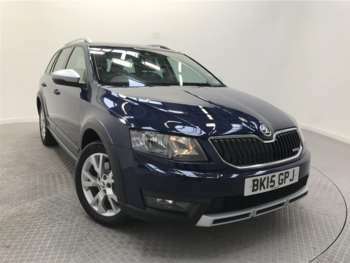 You’ll be pleased with the performance of a used Skoda Octavia and ride comfort is high in all trims. It’s stable and precise on all roads, making it easy to drive these cars on both long and short journeys. Got a specific Skoda Octavia model in mind?